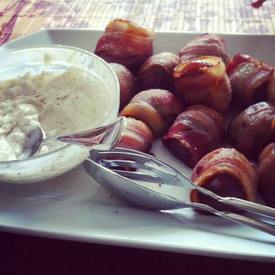 When I saw the following recipe for bacon-wrapped potatoes (which you then dip in homemade ranch dressing…UH HUH! ), I immediately ran to my bacon stash (why yes, doesn’t everyone have one? ), pulled out a handful of potatoes, and went to whipping up this most delicious and amazing recipe. If you too are a lover of bacon and potatoes (and ranch dressing, OH YES! ), then I suggest you run to your own bacon and potato stash and get cooking too. 15 slices bacon, halved crosswise. 1. Steam the potatoes in a steamer basket in a large saucepan until tender. (Don’t have a large steamer basket? I used a our large metal pasta strainer!) This should take about 15-18 minutes. Let them cool. 2. Heat your oven to 425F. Line a rimmed baking sheet with foil. Wrap each potato half with a half slice of bacon. Place bacon wrapped potatoes seam side down on the baking sheet. Bake until the bacon is crisp, 18-20 minutes. 3. Whisk the mayo, buttermilk, dill, black pepper, and salt in a medium bowl. 4. Stand back in awe (with bacon grease on your fingers) and be amazed (as you crunch on your incredible bacon-wrapped potato appetizer) that this is one of the simplest recipes (oh nom nom nom) that you have ever made. And yes, please dip them in the delightful dill sauce/ranch dressing too. Because if there’s anything that pairs with a fine bacon and potato dish, it’s a fine little sauce like this. Am I right?